What has the architecture of Chipping Campden in common with Milton Keynes? Both were designated new towns. Milton Keynes on the 23rd January 1967 and Chipping Campden towards the end of the 12th century. 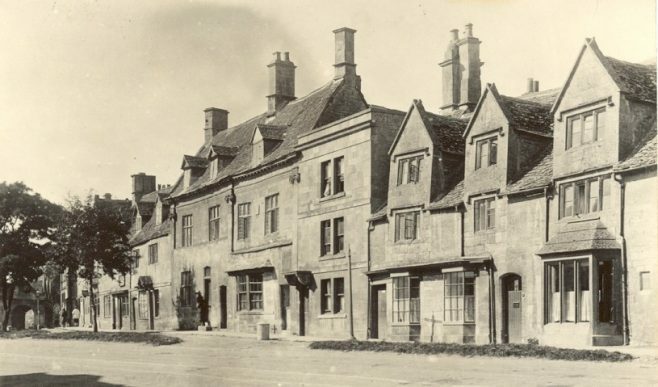 Unlike Milton Keynes, the buildings of Chipping Campden have evolved through eight hundred years. During that time the fortunes of the town have ebbed and flowed and this, together with changes in fashion, regulations, taxes, availability of materials and skills, has resulted in the eclectic styles of architecture we see today. To read the architecture is to read the history of Chipping Campden. One of the areas of study by CCHS is to consider how the buildings in the town evolved and why they look the way they do. Many are familiar with the flagship buildings in the town such as Grevel House, St James’ Church, the Almshouses and so on. However, many of the less well known buildings have their own story to tell. A little basic knowledge can open up a wealth of information as to how they evolved. 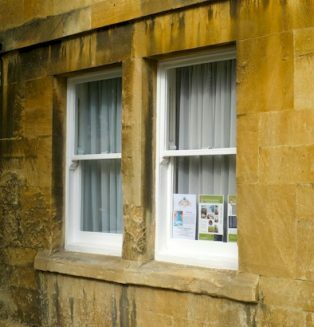 Let us take as an example these two windows on the ground floor of one of the High Street houses: it is well documented that prior to the late 17th century many buildings in Chipping Campden High Street were box timber frame with wattle and daub infilling. A few, like Grevel House, were constructed of stone and some were a hybrid of part stone with the remainder constructed in timber and wattle and daub. From the late 17th century, many of the timber frame buildings were re-fronted in stone. A closer inspection of these windows tell us they are the sash window type which was invented circa 1670. 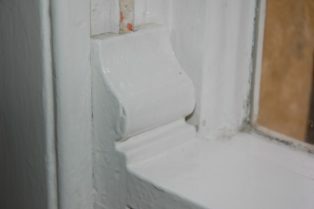 The window is set back from the front face of the wall by approximately 100mm (4inches). There were a number of Building Acts introduced following the Great Fire of London in 1666. The 1709 Act required timber windows to be set back from the face of the building by at least 4 inches in order to restrict the spread of fire. A further Building Act in 1774 required the sash box to be concealed behind the stone facade, which is the case here. Therefore it seems reasonable to assume the facade to this building was built sometime after 1774. The two windows are situated quite close together, in fact 200mm (8 inches) apart. The Window Tax was introduced in 1696 and repealed in 1851. If two windows were closer than 300mm (12inches) then the two windows count as a single window for the purposes of the payment of tax. So this suggests the spacing of the windows was a deliberate attempt to mitigate the tax liability. So perhaps this all points to a facade built sometime between 1774 and 1852. The style of the facade is Georgian, which points to 18th rather than 19th century. The owner of this building between 1767-1793 was a man of substance called William Tompson. What does a man of substance do when buying a new home? – ‘gentrify’ it with a fashionable new stone facade built in the Georgian style fine quality ashlar. So with some degree of confidence we can say the stone facade was built sometime between1774 and 1793. But that is not all: the original timber window frame would probably have been a multi-plane with many glazing bars. During the 19th century the technology for producing glass improved and this, together with the repeal of the 1745 Excise Act in 1845 where glass was taxed by its weight, encouraged the use of larger and heavier panes of glass. Larger sheets of glass used in the typical double pane window required a thicker frame and therefore stronger mortice and tenon joints. This was achieved by incorporating ‘horns’ at the joints. So the architecture in Chipping Campden reflects changes in fashion, regulations, taxes, availability of materials and skills as well as the economic fortunes of the population. These are all brought together to shape the beautiful town that we see today.